PIMS - Deemed University has been empanelled by State Health Systems Resource Centre (SHSRC), Pune, Government of Maharashtra for providing technical support to National Rural Health Mission (NRHM) and Public Health Department (PHD) of Maharashtra. As a technical consultant, PIMS is expected to extend project based consultancy to SHRC in the fields of Public Health, Economics, Human Resource Development. This empanelment is effective from Nov 2012 up to Oct. 2013. The Centre for Social Medicine (CSM) - a constituent of unit of PIMS - Deemed niversity will coordinate with SHSRC, Pune and other constituent institutes/centres of PIMS for smooth conduction of the activity. Councils constituted under PCPNDT Act in Maharashtra. 2. Evaluation of two service NGOs from Akola and Thane. 3. Evaluation of Community-based Monitoring of Health Services in Maharashtra. All India Entrance for Admission to MBBS & BDS course for academic year 2013-14. 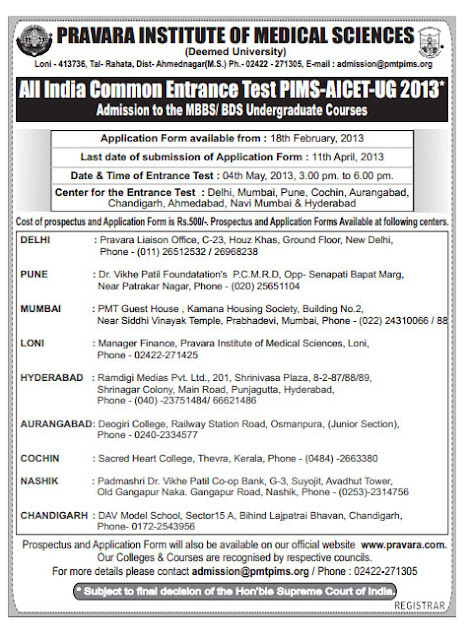 Applications are invited from eligible candidates for All India Common Entrance Test (PIMS-AICET-PG 2013 *) for selection of candidates for admission to Postgraduate Courses in Medicine (MD/MS/DIPLOMA) & Dentistry (MDS) for the academic year 2013-14 in the constituent colleges of Pravara Institute of Medical Sciences (Deemed University). A candidate who has completed one year compulsory rotating internship or is likely to complete the same on or before 31 March, 2013 can appear for PIMS-AICET-PG 2013 . Candidates who are previously registered and pursuing/completed the PG degree course or have obtained PG degree, are not eligible for appearing at PIMS-AICET-PG 2013. Candidates previously admitted to PG degree course and resigned/left the seat are not eligible for appearing at PIMS-AICET-PG 2013 . Candidates who have completed Medicine postgraduate diploma course or would be completing by 31.03.2013 will be eligible for PIMS-AICET-PG 2013 for admission to Medicine postgraduate degree in the same subject only.